Update: Syrian Cabinet Resigns; Assad Expected To Offer Concessions : The Two-Way The Syrian leader would remain in place. He's hoping that concessions will satisfy protesters, who have raised the most significant challenge yet to Assad's rule. 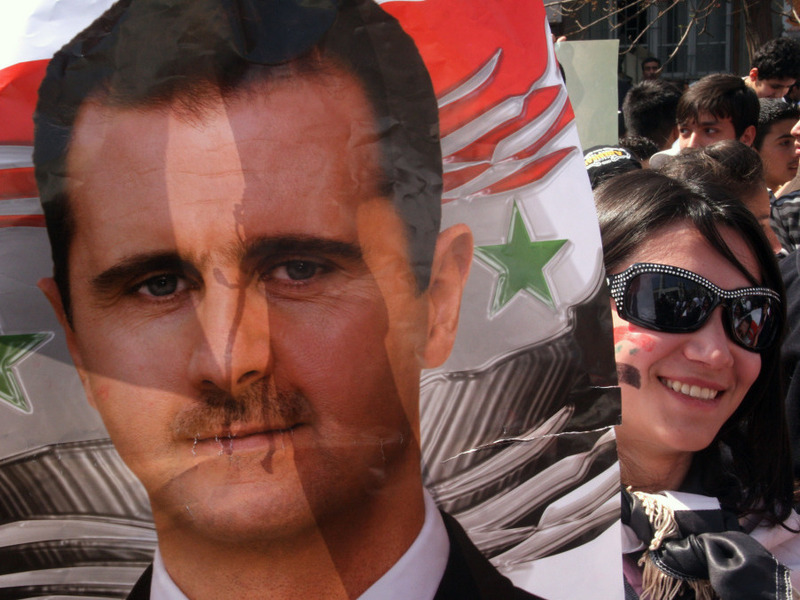 A supporter of Syrian President Bashar Assad carried a poster with his image in Damascus earlier today (March 29, 2011). The Associated Press says that "hundreds of thousands of supporters of Syria's hard-line regime poured into the streets of the capital Damascus and at least four other major cities Tuesday, waving pictures of the president and flags as the government tried to show it has mass support in the face of protests demanding more freedoms in this tightly controlled Arab state." President Bashar Assad, the AP adds, "is expected to address the nation in the next 24 hours to announce he is lifting a nearly 50-year state of emergency and moving to annul other harsh restrictions on civil liberties and political freedoms." Also, "Syria's independent Al-Watan newspaper said the Cabinet was expected to resign during its weekly meeting Tuesday, a move that would be viewed as another concession to the protesters." As the BBC says, "Assad is trying to quell almost two weeks of pro-democracy protests against his regime that human rights groups say has left more than 60 people dead. The unrest has become the biggest threat to the rule of President Assad, 45, who succeeded his father Hafez on his death in 2000." As Al-Jazeera reminds us, while the Syrian Cabinet has resigned en masse in what looks to be an effort to appease protesters, "the government has little power in Syria, where power is concentrated in the hand of Assad, his family and the security apparatus."